Vacation is over . . . what a kick in the pants. I need to recap our week of fun, but I'm still adjusting to the real world. And nothing says back to reality like taking your child to have a "surgical procedure" on Monday. Good times. Technically his procedure wasn't really a big deal, especially since I can currently hear him yelling at video games in the basement . . . with friends who slept over last night. So yeah, he's fine. But the thought of it was very hard on his mama. What is a frenectomy you ask? Well, here goes your medical lesson for today . 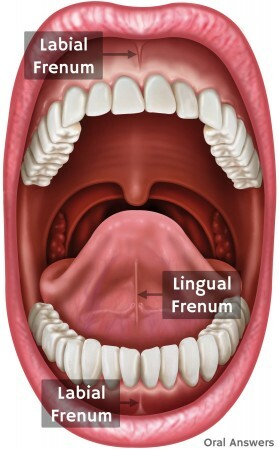 . .
A graphic to further your frenectomy education. How did I know he needed such a procedure? 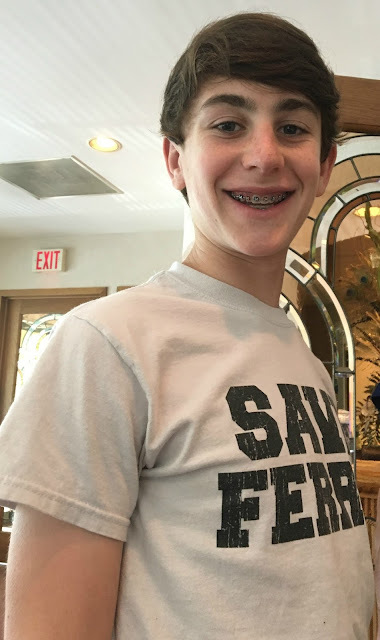 Ryan's frenum above his front teeth kept getting irritated in his braces. I mentioned it one time to the orthodontist, and he referred us to a periodontist. While Ryan was "on the border" for being a candidate, the doctor felt like the benefits and ease of the procedure outweighed the potential problems later in life. Uh, what problems? Apparently over time it could cause a gap to form between the two front teeth or pull the gums away from the teeth which causes major issues for an adult. So after asking Ryan what he thought, we agreed to have it done. He's such a tough kid . . . he never appeared nervous and just accepted that it needed to happen. I take him on Monday to the office, fill out all the paperwork, pay and then we wait. He's a teen . . . not that chatty and not into me taking his picture. Once they called him, I got up to go with them, but they told me I had to stay in the waiting room. I freaked out internally for a second, but Ryan assured me he was fine. Then I snapped a quick photo because . . . I don't really know why except he was leaving me. So I sit their waiting anxiously . . . fretting that I didn't take a picture inside his mouth. Weird. I know. But I did hear an awesome song from back when I was in college . . . Sting's Englishman in New York. I had that CD. Could I be more random here? Songs make me remember moments in time so this song now has a new connotation. Sitting in a dated (there was some serious mauve and powder blue) waiting room anxiously awaiting my kid. A nurse comes out and gives extensive instructions to another mother about her daughter so I listen intently. . . because I'm nosey. Good thing because when our nurse brings Ryan back to me she says, "Well, all done. I gave him the instructions while he was back there." I just look at her like she'd lost her mind. Seriously, he's 14. But in reality, I knew he would tell me, and I had heard excessive details from the other nurse so I just left . . . with a bit of rage. I basically wanted to baby Ryan and take care of him, and he's all like, "I'm fine mom." Somebody hold me. My baby doesn't want or need me. Here he is in the car on the way home. He set his phone timer and kept putting ice on and off for 20 minutes at a time. He used my knee wrap to hold the ice around his head so he'd have two hands free for playing video games. Rather ingenious I suppose. He said it really didn't hurt, but I'm making him rinse with his prescription "magic mouth" wash a few times a day anyway. Apparently the taste is nasty . . . oh well. He has to keep the "bandage" in his mouth until our appointment next Tuesday. So yeah, he gets to start high school like that. You can't see it unless he smiles so I guess my first day pictures may be less than enthusiastic. Thankfully he's doing great and it's over . . . time to enjoy the last week before school starts. Birthday things . . .
At this point in the summer, I've mostly lost track of what day of the week it is . . . that's a good thing I think! 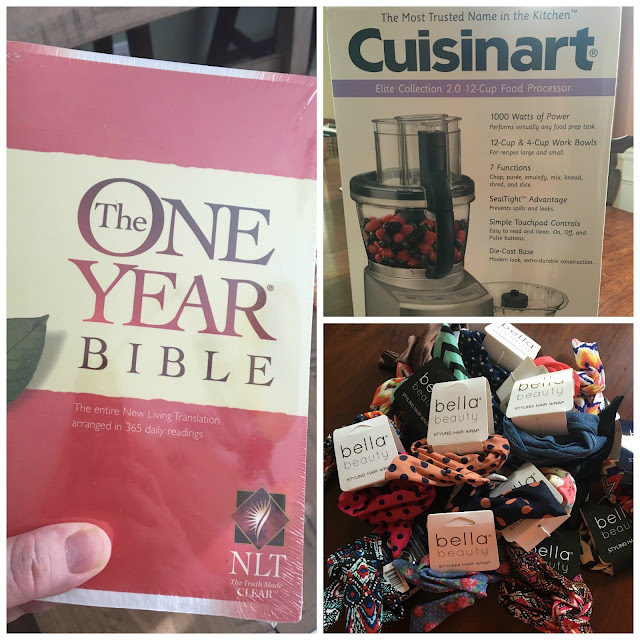 Today I thought I'd recap some birthday things that made me happy! So a couple of weeks ago I was at the pool with some of my mom friends. We were chatting it up, and I mentioned that I was going to be alone on my birthday since everyone but dear old mom was going out of town. They were all like, "So your house is empty?" And I'm like yeah, just me and the dog. And then they announced "Girls Night IN!" I was like, "Brilliant!" So some texts were sent and boom, birthday plans! Y'all. I love having a tribe. And I feel like I have a few different tribes, and they are all equally important to me. These are my people. I really try to surround myself with women who build each other up and would be there no matter what. I feel like I am that kind of person, and I feel like it's what I attract. So each of these ladies should know they hold a special place in my heart . . . who knew a little planning at the pool would turn into such a fabulous night! My friend Tina shows up with themed birthday shots! These were totally Pinterest worthy and packed a punch! Cheers. My friend Amy made me a homemade birthday cake! Did you hear that? Homemade!!! 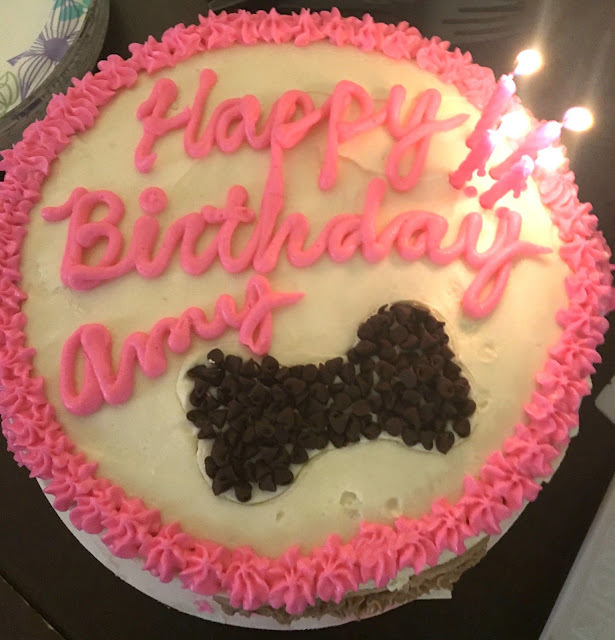 And she decorated it with dog bones. I die. Loved it so much! 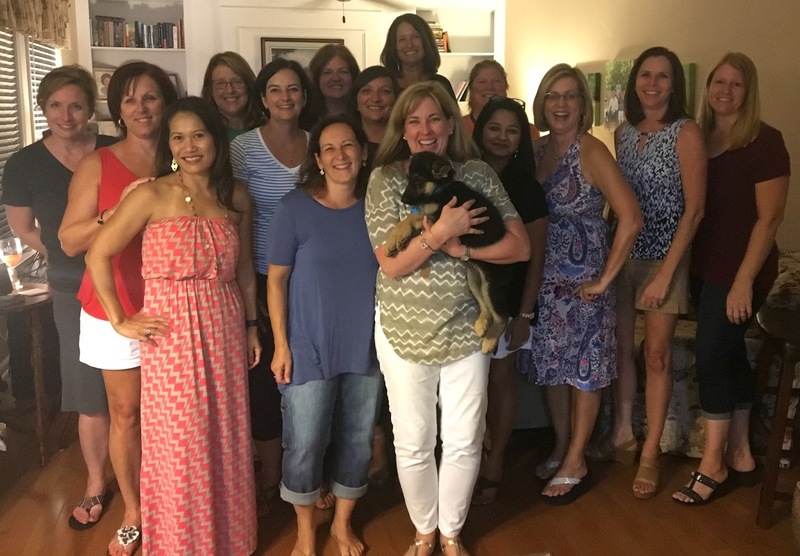 It was a lovely evening of friends, food and fun. Everyone brought an appetizer and cocktails so I didn't have to do anything. How awesome is that? Friends were making me drinks and cleaning my kitchen . . . so spoiled. And speaking of spoiled, they loaded me up with gifts. This was so totally unnecessary . . . I was just happy not to spend my birthday alone. Look how generous my friends are with me! I realize I forgot a couple of things I had already put away but wasn't setting this up again! I also got a hula hoop, which cracked me up. Y'all, I really feel like I can hold my own on the dance floor, but the hula hoop eludes me. My friend Amy thinks that's funny so she got me a fancy weighted one so I can practice! In contrast, my Amanda has won hula hoop contests. I swear she could cook dinner and keep it going. She doesn't know it yet, but she's giving me lessons. This is pretty much me when I try! 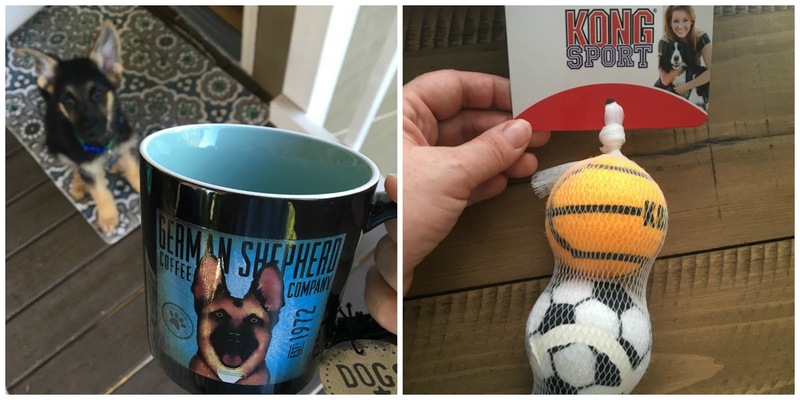 Do you have any friends that would be ridiculously excited to receive dog togs and dog themed items for their birthday? Well I got all excited when I opened these gifts!!! Amanda loves to shop for gifts for people. Her daddy was supposed to take her to the mall, but he ended up going on his way home from work. She was not happy with him. She apparently knew what she wanted to get me so he helped her find it online. One has to appreciate a daughter who is trying to help keep her looking young! Seriously, this is actually a very thoughtful gift because she pays attention. Amanda and I were at the mall a few weeks ago shopping for things for her trip. Bath & Body Works was out of my favorite eye cream . . . the shelf was empty, and she heard me ask the cashier if they had any in stock, which they didn't. So she made sure to get me some for my birthday . . . sweet girl. 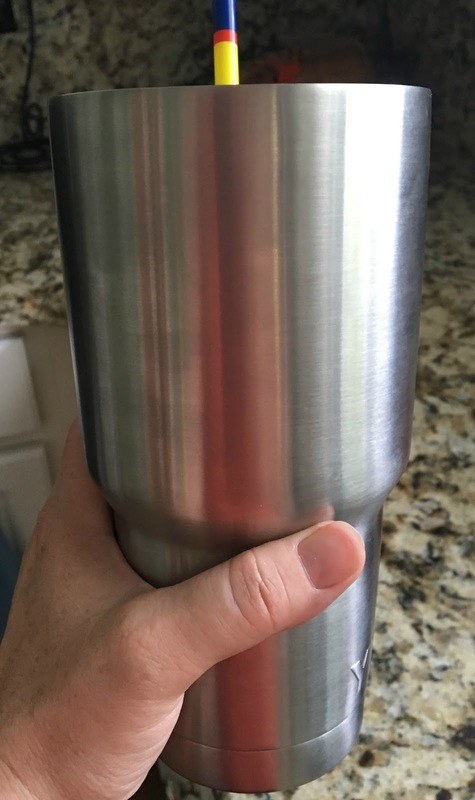 Getzy, out of desperation to get his own cup back, bought me a new stainless steel tumbler! It holds 30 ounces and makes it easy to measure how much water I'm getting!!! Now he doesn't have to share. I love the giant straws from Starbucks . . . they fit these nicely! My friend Kim took me to lunch and brought me presents that were wrapped. Like in actual wrapping paper. Call me a kid, but I love to unwrap a gift. I know, gift bags are easy, but there's just something about ripping paper and wondering what could be inside that appeals to me. And look what fun stuff she picked for me?!? Love it all! She reminded me that I always say the words "random crap." I'm sure Getzy will be glad when July is over. 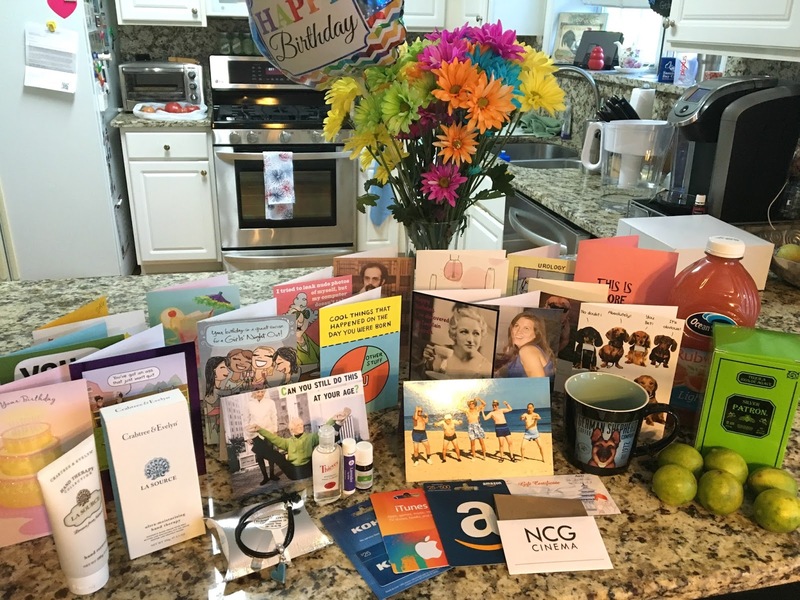 I keep buying myself stuff "for my birthday!" And it's all random crap . . . see, didn't even mean to do that! The bible was inspired by Mix & Match Mama . . . it's on my Bucket List to read the Bible all the way through, not necessarily in a year though. I've stopped and started a million times so maybe this will help keep me on track. The Cuisinart is because the Pioneer Woman makes all kinds of cool things in hers so surely this will kick my cooking up a notch. And finally, the head wraps are inspired by the sweet Andrea from Living on Cloud Nine . 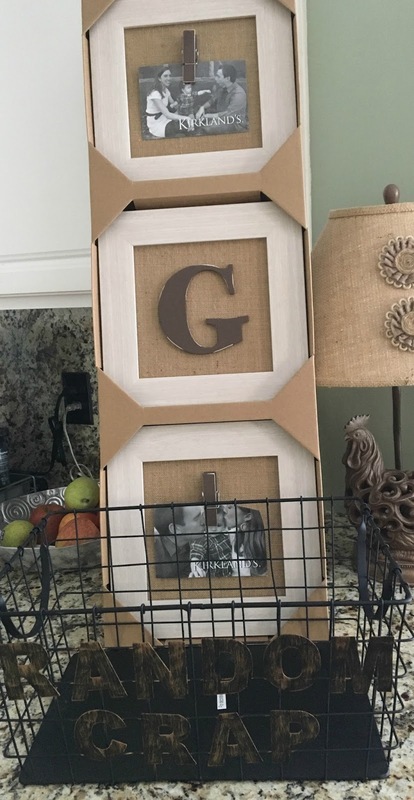 . . how fun are these and you get a ton for only $9! Woot! We won't discuss the various dog toys I've gotten myself Zeus, all in the name of my birthday! But the best birthday gift of all was having Getzy come home from his trip and walk in the house happy to see a new animal . . . that's a first! The last one to leave the nest . . . 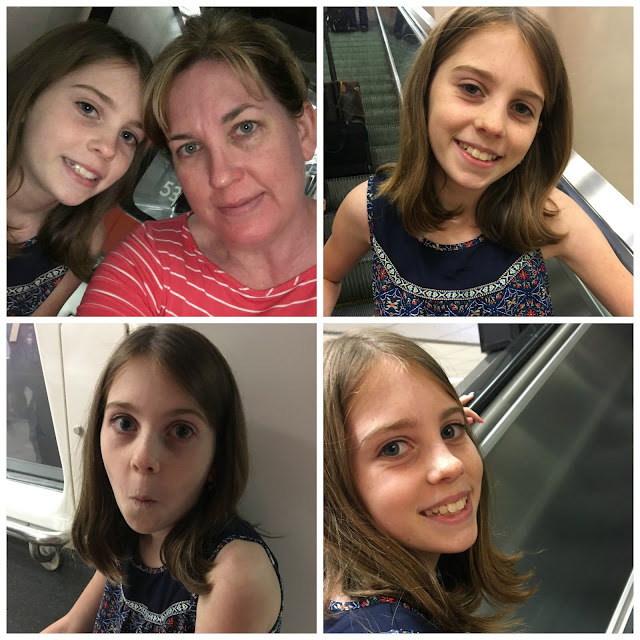 I thought I would tell you about the recent adventure of my independent, list making, little alpha mini me. Please prepare yourself for an overload of pictures of her . . . I'm aware it is excessive. 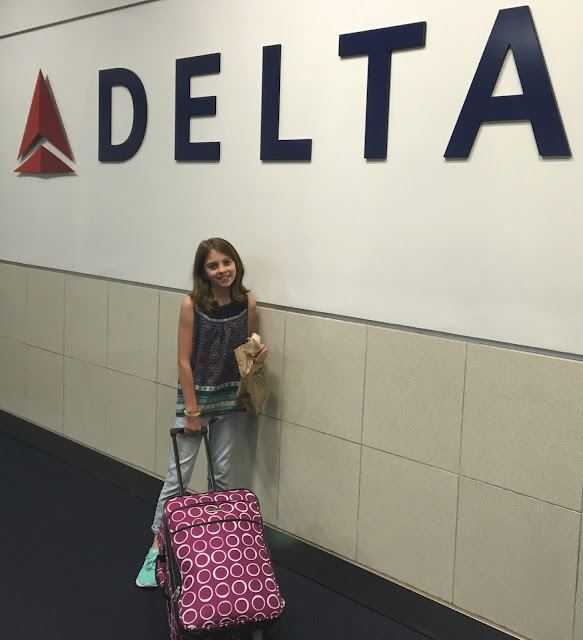 Why yes, she did "need" new luggage for her trip! One of my most favorite friends moved to Florida last year and left Amanda and I brokenhearted. Of course I was happy for them, but super sad to see them go. Amanda has been asking to fly to see them since the day they left. 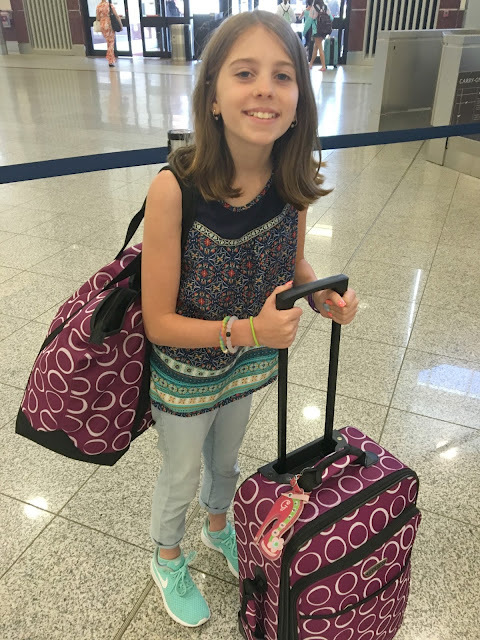 She keeps telling me that her friends have flown as unaccompanied minors so she wants to try that too. As her mother, I was not a fan of this option. At all. That's my baby, you know. 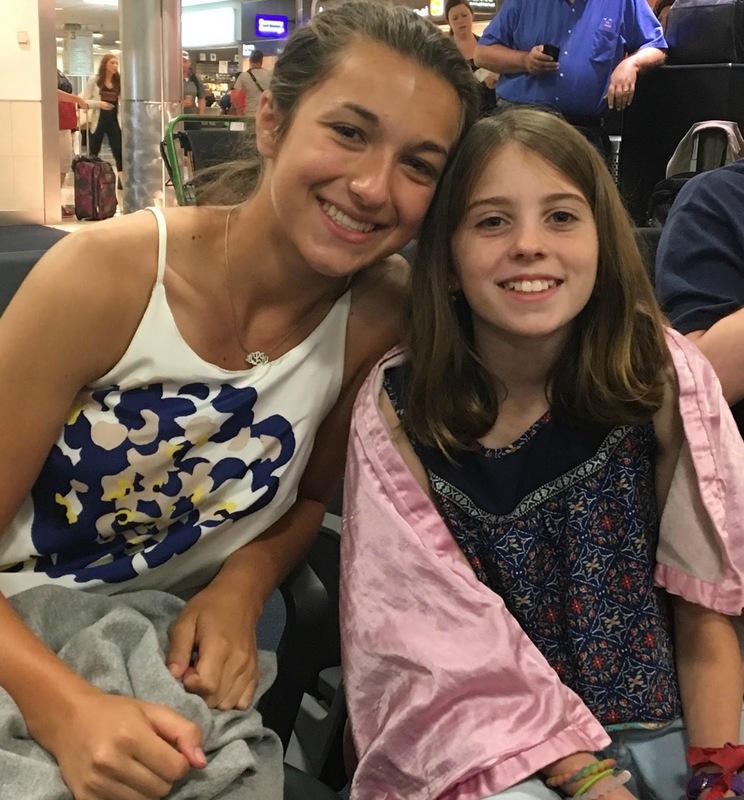 So this summer, we cooked up a plan for Amanda to fly on the same flight as her daughter and her friend, who were returning home after a summer horse riding adventure! I thought about keeping it a secret but caved . . . Amanda was beyond excited! She's had her bags packed, her flying outfit laid out, gifts purchased for her friends and a daily countdown alert on her phone for weeks now. And this past Monday was the day of her flight! I had to purchase an unaccompanied minor ticket because my friend's daughter was under 18. That's actually a good thing because then I got to walk her to the gate! She tells her new puppy goodbye and off we go! How about those fancy nails? She is so girly! We checked in at the gate and completed some paperwork. Here she is getting ready to check her bag. It was only 17 pounds . . . she could handle it, right? Until they wanted to charge another $25, and I told her to find someone to help her put it in the over head. Real life kid! 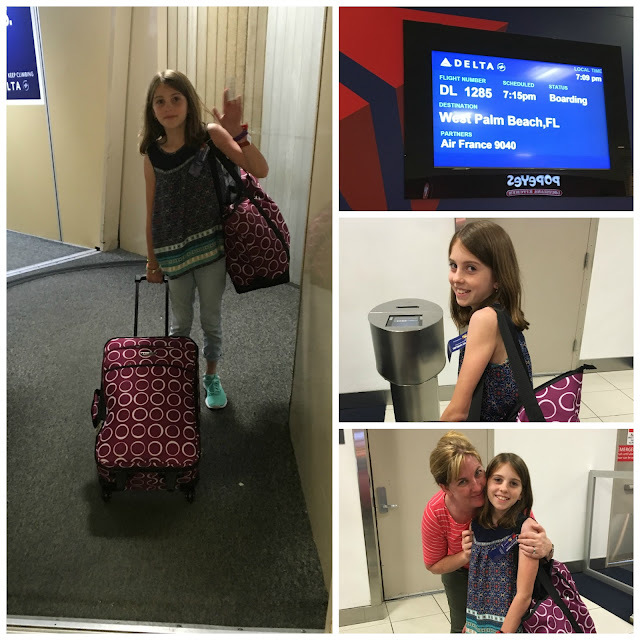 Speaking of real life, once we had her ticket, I told her she had to lead the way to her gate. Of course I was there to guide her, but I wanted her to use her common sense and previous flight experience and do it herself. She's always up for that kind of challenge! So we head through security . . . she got to keep her shoes on and we were waved through the smaller metal detector which was nice. At this point, she is tired of me taking her picture. She can't possibly understand how hard this was on me as her mother . . . so I just kept making her pose. Trains, planes and escalators . . . Here she is showing off her "LoJack" as I called it . . . her tracking device! Please don't lose my baby!!! Excuse ma'am . . . can I scan your QR code? I should have tried that. "Mom, are you serious?" Yes, please pose under the Delta sign! And for the record, I would totally recommend Delta . . . she had a fabulous experience. Snacks in hand ready to board!!! I took this because she was leading the way like a champ . 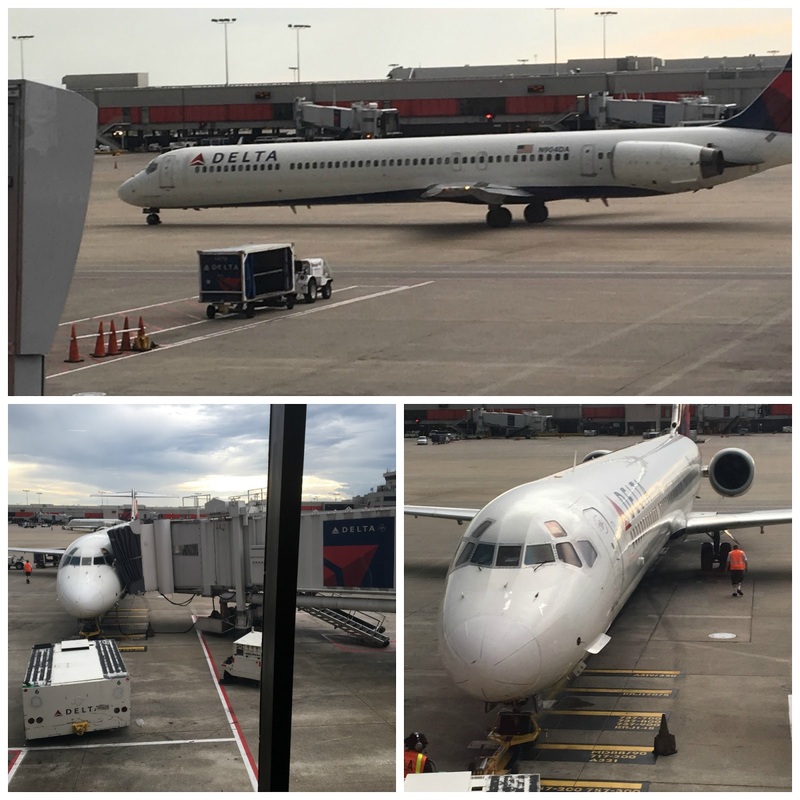 . . she barely looked back in the crowded airport to make sure I was behind her. I guess she knows mom will always be there, and she doesn't have to check. Sniffle. We make it to the gate and wait for her friend to arrive! She was so very happy to see her surrogate big sister! Madelyn is the one that introduced her to horseback riding! She is such a good girl . . . great student, so polite and excessively kind. I always tell Amanda that if she wants a girl to look up to, it's Madelyn!! I just love that teenager so much! Such a great girl! And then it was time to board . . . I put a smile on my face and reminder her that she is strong and to speak up if she wasn't comfortable in any situation on the plane. The lovely gate attendant told her the same thing, and then after several kisses and I love yous . . . off she went. See ya suckas . . . Amanda out! I sat back with Madelyn and her friend to wait for them to board. Said my goodbyes and then headed over to the window to cry. This was the hardest part . . . knowing she was on there, out of my care and in God's hands. Isn't this what we want as parents? 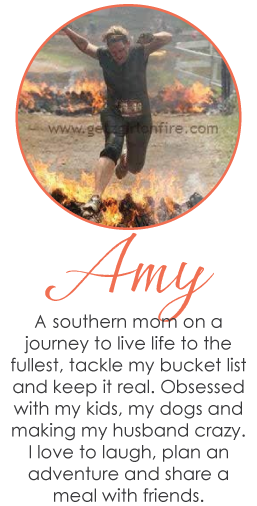 Our kids to be adventurous and independent and confident enough in themselves to leave home and try new things. I kept reminding myself that as I stood there and cried . . . I'm doing my job . 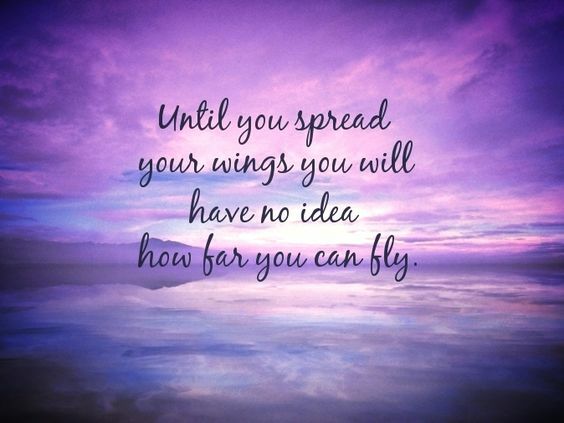 . . literally giving her wings to fly. She made it to Florida safe and sound with a big smile on her face happy to see some of her favorite people. 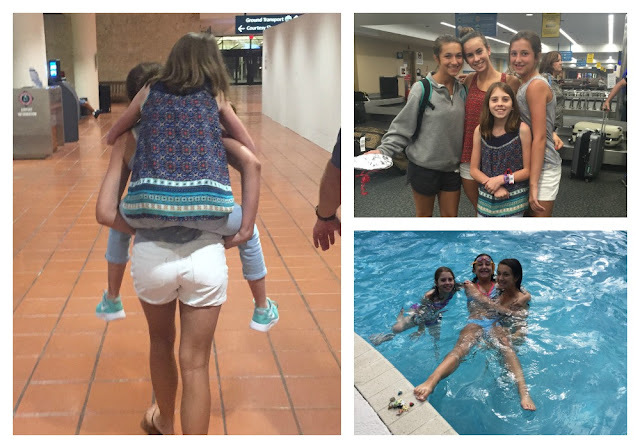 How lucky am I to have friends willing to take my kid and treat them like one of their own? I know the answer to that . . . VERY lucky. 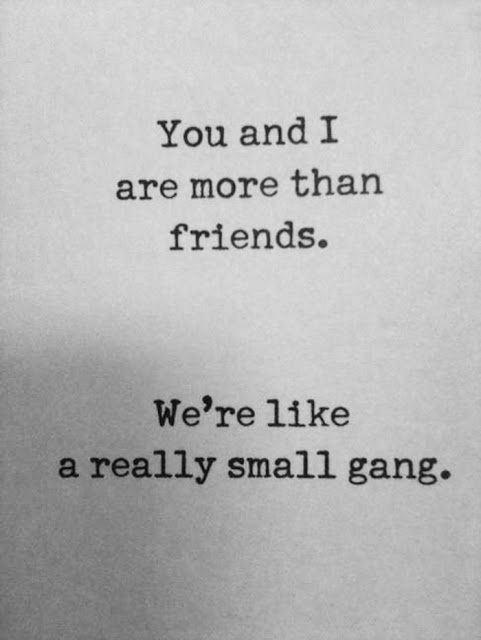 Love you long time my friends. Bucket List Item #24 . . . Zeus! You guys . . . I may have overloaded my emotional self recently. Hold on, I'll explain . . . but I need give you too many details (as Getzy would say) and set the scene. My beloved Petey went to heaven on April 27th at 16 years and 1 month. This was one of the reasons I took a blog break . 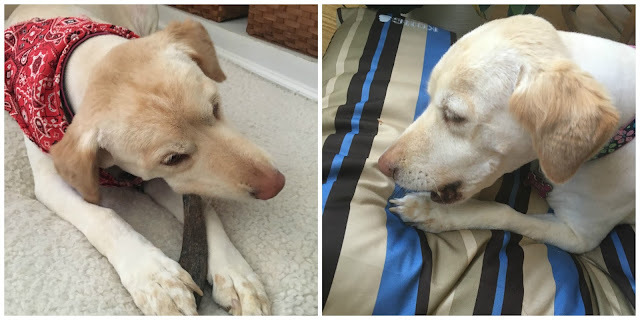 . . his care was exhausting, and it just about broke my heart when I had to make the decision to put him down. The date I made the decision was April 25th (this date becomes important later so keep reading.) I plan to write about my Petey in the future, so that's enough for now. Even just going back to find a few pictures of Petey inspired a major crying fit . . . it's still so hard on me. In early April when I was out of town with my mother, Getzy had Amanda create a contract whereby she was the one who got to choose and name the next family dog. Say what? Please review the terms of the contract. Apparently he was very impressed by her care with an ailing Petey . . . and she also agreed to never ask for a hamster again. If I'd have known that begging incessantly for a hamster was all it would take to get new dog privileges, I'd have tried that a long time ago. But seriously, Amanda loved her Petey. This was his last day . . . I would bring him in every morning to say hello to her and they would snuggle. Funny side note: Her pajamas say "Get Cozy," but the seams make it seem like they say "Getzy!" Cracks me up. Notice the bottom of her shirt . . . she loves Petey inspired clothing. Aww. As you can imagine, dog talks have been abundant around here. I originally thought I wanted another Boston Terrier so I Jedi mind tricked Amanda into wanting one and naming her Rosie. The boys wanted a bigger dog, like a Husky, but I put the hammer down on that. Getzy has always wanted a German Shepherd so they boys jumped on that bandwagon. Amanda wanted a little dog she could carry around, as any 10 year old girl would. I kind of agreed with her until I realized I wasn't getting any younger so if I was going for the big dog, better to do it now than when I'm older. I also thought that it would be better for Amanda if we got the big dog now, and then she could get a little dog when she moves out on her own. 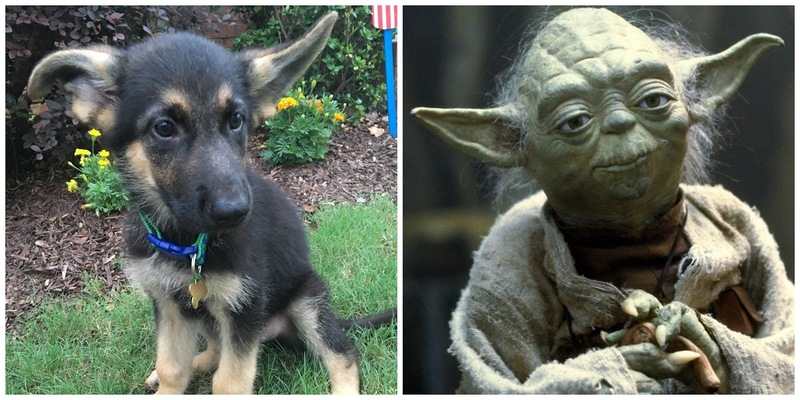 So, I worked my Jedi mind tricks AGAIN and convinced her that she wanted a German Shepherd. 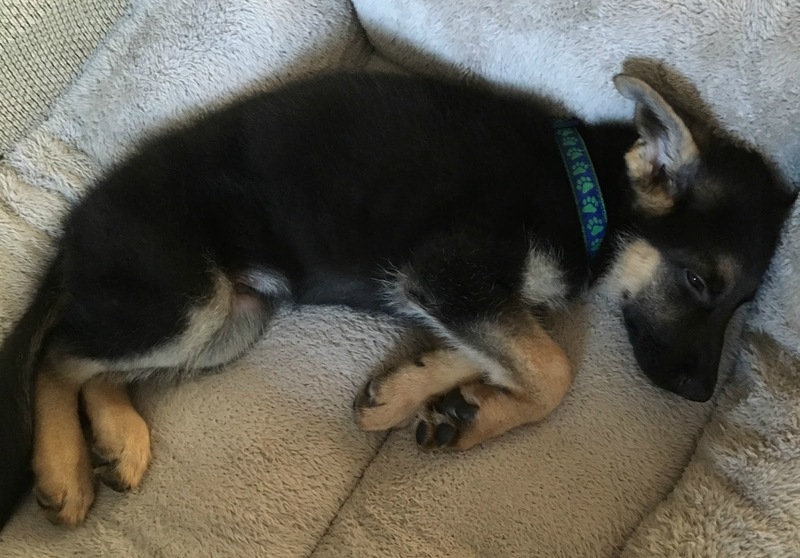 We did go back and forth a bit but after exhaustive Internet searches for both breeds, we finally found a German Shepherd breeder that we liked. And who seemed knowledgeable. And responded in a timely manner. And who had the coloring of the dog I wanted. And available dogs. 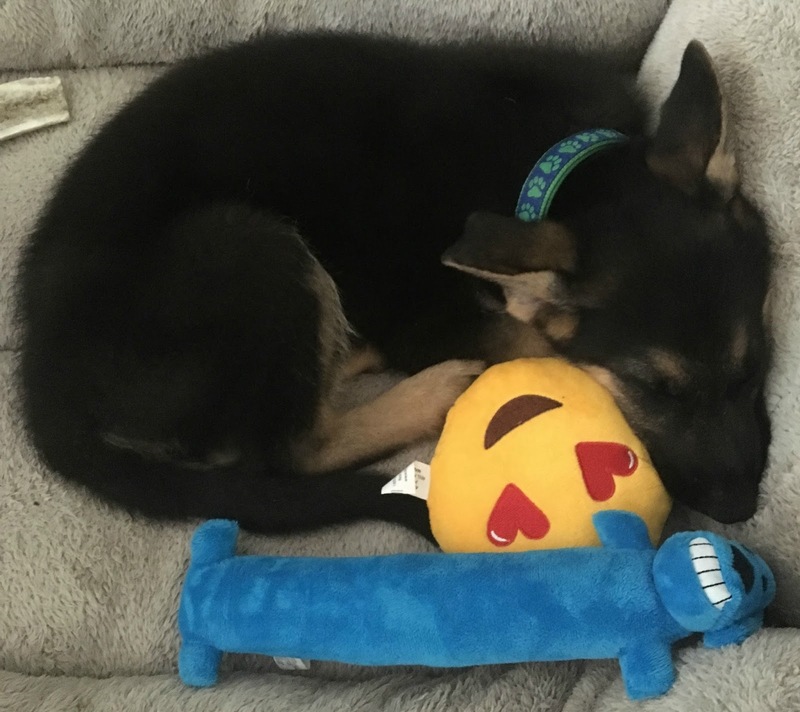 You guys, I don't approve of buying your pets from pet stores, but I can understand why some folks resort to that because it's a hard process to find the right dog from the right breeder for the right price online. So in the midst of a chaotic weekend with Getzy leaving for Singapore Saturday, the boys leaving for camp on Sunday and Amanda leaving for Florida on Monday, I decide it's a great idea to drive to Alabama to check out a puppy. I may have overestimated my super powers . . . that's a lot of emotions to harness in a short period of time and with very little sleep. But I'm here and have pulled it all together! So Getzy leaves for the airport Saturday, I pick Ryan up from a sleepover and 10 minutes later we are on the road to Alabama. I originally went for a specific litter of puppies that were 9 weeks old. I knew she had two litters, but I was focused on the younger ones. Well, when I get there and saw their mother, I realized I wasn't as drawn to her "angles" as I thought. What the heck do I mean? 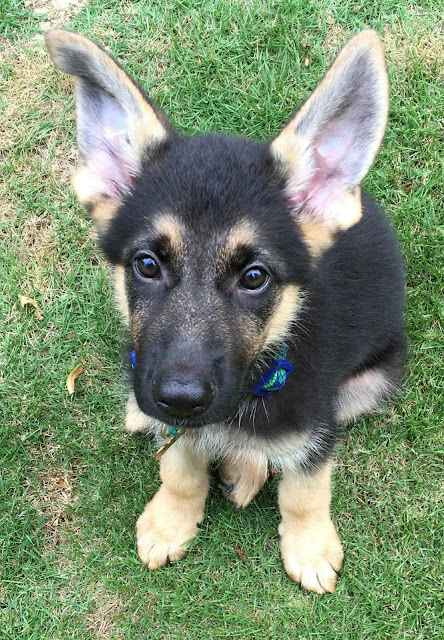 You're about to get way too much German Shepherd (GSD) information. American line GSDs have a different look to their hind quarters than German line GSDs. This is a typical AKC champion . . . see how gorgeous he looks standing there with his back legs bent in the typical GSD pose? Well, when they walk, it actually looks similar. Some folks think this is gorgeous, I thought it to be awkward. So since the mother of the puppies was 100% American line, I could see those angles in the puppies and decided against them. The mother of the other litter was 100% German line, so she didn't have the excessive tilt to her back end. The father was roughly 2/3 American line and 1/3 German line so these puppies were more the look I preferred. Remember this is a family dog and sorta kind of, but not really, Amanda's dog so she picked the shyest male puppy of the litter. And the boys agreed. Gah. 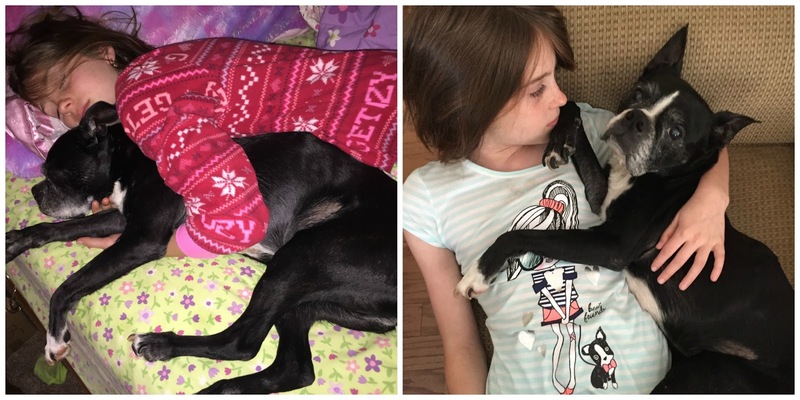 Most folks don't recommend getting the shy puppy, but again, I'm convinced I have super dog training powers and my kids were in love, so this is the one we chose. He wasn't shaking and fearful, just shy. He was tense when we held him, but the breeder told Amanda to sit down. If he relaxed on her lap, then he would be fine. Of course he smushed down on her, and she melted like butter. None of the puppies off these parents have ever had a poor temperament . . . and she said we could return him if he didn't warm up . . . the breeder really wanted us to be happy. So allow me to introduce you to the newest member of Getz family . . . he's here to stay . . . ZEUS! That picture just kills me . . . it was when we first got him home, and he was like, WTH? He also did not enjoy the two hour road trip home . . . Ryan took good care of him though. Then he started getting used to us, and the ears began making the ascent . . . I think I may have determined his lineage. But he has since realized living in the Getz house is not so bad. He is coming out of his shell and has become my little shadow. Can you even stand the cuteness?!? I can not. Since I mentioned he does have a fancy pedigree, I thought you might like to see his parents. I met his mom on site, and she was big and lovely . . . her name was Holly and she weighs about 85 pounds. Pretty lady. Terrible picture quality, but she was a beautiful girl and very gentle with my kids even when they were holding her baby. His dad was not on site, but here's a picture of him . . . his name is Zeek, and he is a big boy at 105 pounds. Isn't he so handsome? Not the best picture quality but you get the point! I'm almost embarrassed to tell you his formal name . . . it's ridiculous. But listen, I own the crazy so here goes . . .
Can you even stand it? Claps hands in delight! That's a big name for this guy . . . and yes, I can laugh at my own foolishness. We call that blue toy a "Bo Bo" . 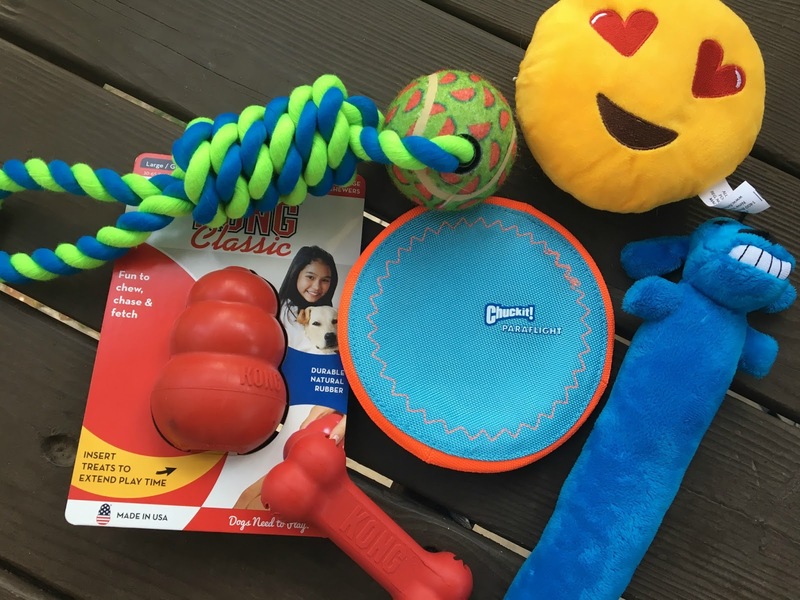 . . Petey always loved to play with those! Amanda chose Zeus . . . please review the aforementioned contract for her naming rights. I told her that while it was her choice, it had to be a big name for a big dog. I think she did a fabulous job! Why the name? 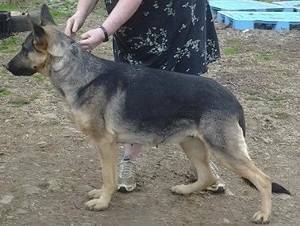 Terays is required from the breeder because he comes from Teray German Shepherds. Zeus is what we will call him. 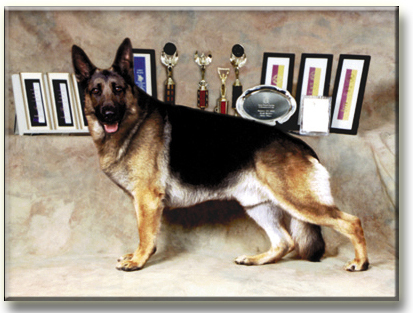 Hektor is after the first dog recognized as a GSD and also in memory of the GSD my dad had before I was born. I've heard about this dog my whole life, and he was part of the reason why I wanted a GSD too! Von is because he's fancy. It really means "from" and was used by German nobility to indicate the father's lineage. And voila! Over the top name. I can't wait for his certificate! Y'all, I asked my mom to bring me some childhood photo albums on her last visit and look what I found! 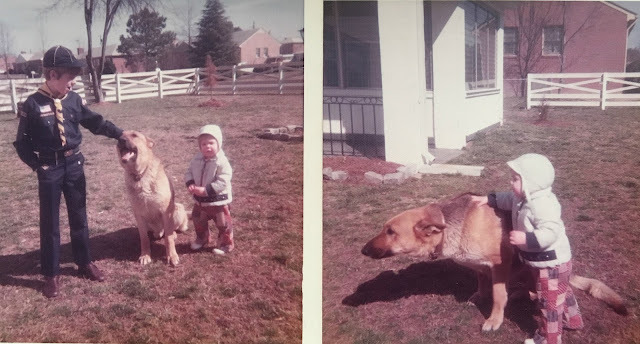 Pictures of my Dad's GSD Hektor with my two older brothers in 1972. This makes me so happy. GSDs need lots of socialization so we took him to meet folks when we we were dropping the boys off for their camp bus ride . . . this is where he spent most of that time as people came by to say hello. I'm sure he's thinking, "Gah, why are so many people messing with me?!" Amanda was so proud to show off her new puppy! And speaking of my boys leaving me, this is Ryan's 4th year and Kyle's 3rd year so we have this camp thing down to a science. Both boys love to go and even packed their own trunks this year . . . I did get last approval rights and went through their checklists with them. My boys and my honorary kid, Trenton! These three . . . they are so fun and adventurous! For the record, Ryan did have a hat on earlier, thus that crazy hair! After waving goodbye to the boys, Amanda and I took Zeus to get some chew toys. I was the freak in the store that was like, yeah, don't touch my puppy unless you've washed your hands. I only brought him because there was no one at home, and I didn't want to leave him yet. But would you just look at this little guy? Amanda had fun picking out toys . . . here are her selections, with a little advisement from me. We went to the fancy dog food store for the food, treats and chew sticks . . . I am not a fan of rawhide or low quality dog food. Pretty sure my dogs eat better than my kids. So after getting the boys off and the puppy shopping done, I was exhausted. I hadn't gotten much sleep and the puppy was tired so I asked Amanda to watch him while I rested. I woke up and found this . . . my heart went pitter patter. And no, he should not be on the couch but "just this once mom" was the excuse. My current motto is, "Will it be cute when he's 100 pounds?" Generally the answer is no. He went to the vet at 8 a.m. on Monday morning . . . I made the appointment in the car when I left the breeder. Neurotic? Why yes, thank you very much. He got an excellent bill of health which made me super happy. And he didn't seem to mind the car ride down there this time. Which is a good thing because I like to take the dogs in the car with me when I can! How did my Abby react to him? Like a rock star. She's had a lot of prep work with some foster puppies in the past so she's used to me bringing home random puppies. My guess is she thought he wasn't actually going to stay, but I keep reminding her he's here for good! She does alright . . . she even got a new bed and some chew toys! Who wouldn't want to chew on a buffalo horn? 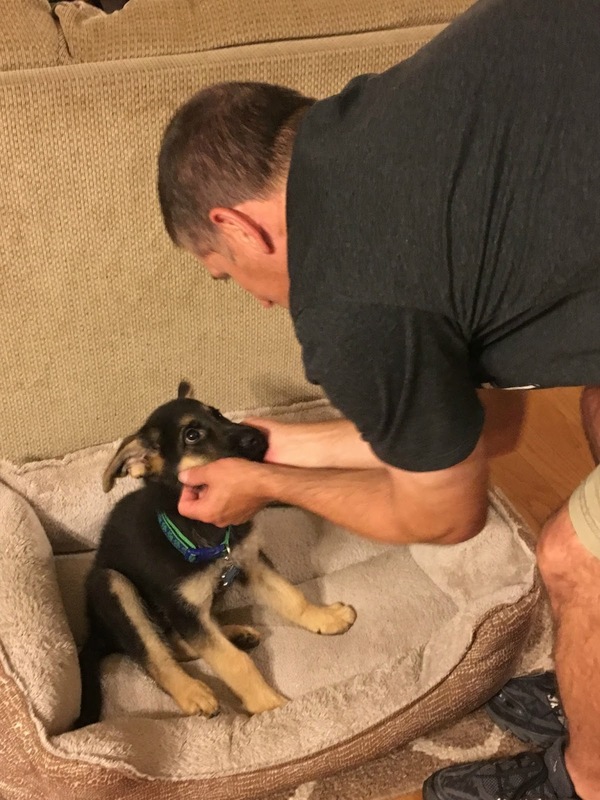 To take on raising a GSD, you need to be prepared for a lot of work. I know this won't be easy, but this is what brings me joy. I'm already tired from lack of sleep. He's going to need lots of training to make sure he is the right mix of confident and protective. But I've seen amazing changes in him over just the last few days, and I know it will be worth it. He's an amazing dog . . . he has not had an accident in the house yet, knock on wood. That is my Petey's old collar . . . I think he would approve of Zeus wearing it until he needs a bigger one! I know without a doubt Zeus was meant for us, his mere mortals. Remember above when I said I made the decision to put Petey down on April 25th? Well, that's the day Zeus was born . . . so as one life that was so important to our family was ending, another life that would become important was beginning. I don't believe in coincidences . . . everything happens for a reason. 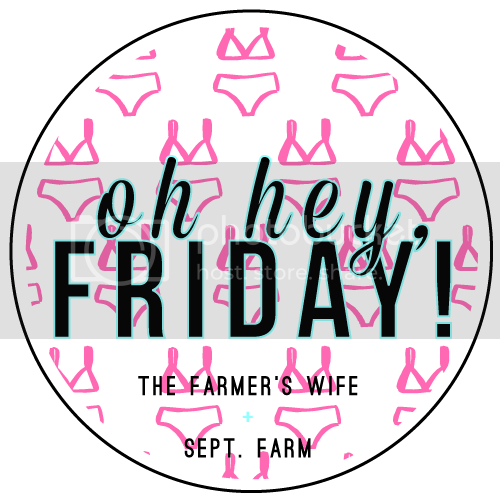 Let's all do the Friday Happy Dance together! Come on . . . hold my hand and let's groove! Although honestly, while I'm not dreading this weekend by any means, I am coming into it with a bit of trepidation because all my people are leaving me. Getzy is flying half way around the world for work on Saturday, my sweet boys leave me for camp on Sunday and Miss Amanda flies off into the sunset on Monday to stay with my friends in Florida. And then mama is left alone . . . just me and the dog until they all come back to me. Speaking of the dog, Abigail got a haircut yesterday! I absolutely love her long, luxurious fur . . . she feels like silk and you can just run your fingers through her fur for days. But it's hot. When I have her shaved, she act like a pretty princess who feels like a million bucks. While these pictures don't really prove that, trust me. She also starts sleeping on the furniture instead of the cold floor so I know she feels better. Would you just look at this cute girl? Sometimes you have to get on her level . . . Getzy was concerned when she didn't greet him at the door. Obviously he needed to lay on the floor to make sure all was well. Apparently she was worn out from being at the groomers. 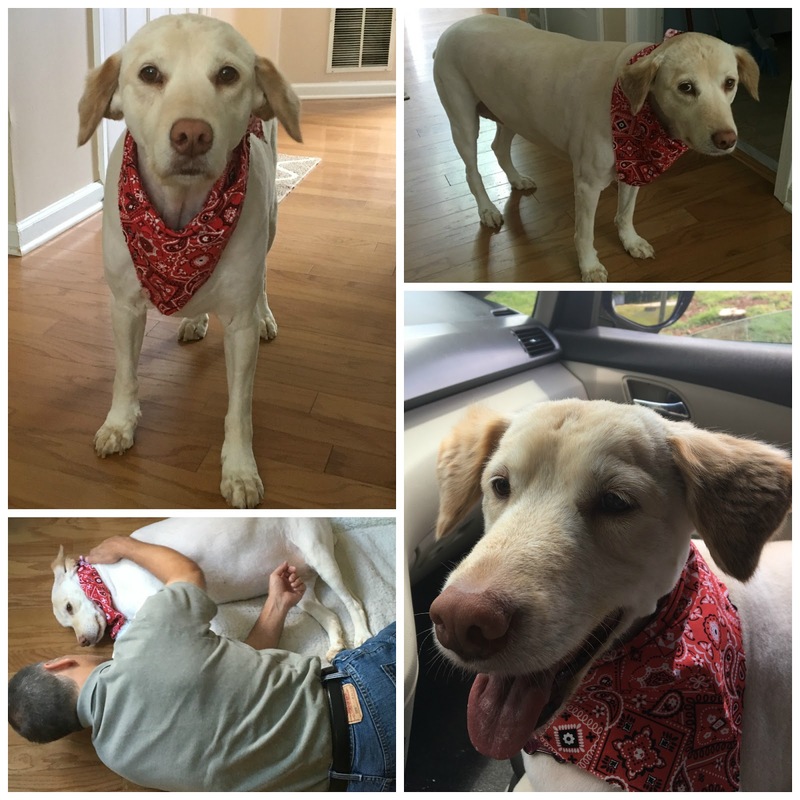 We are starting the process of looking for a new friend for Abby. We haven't really made a decision on what we are going to get, but the two front runners couldn't be more different . 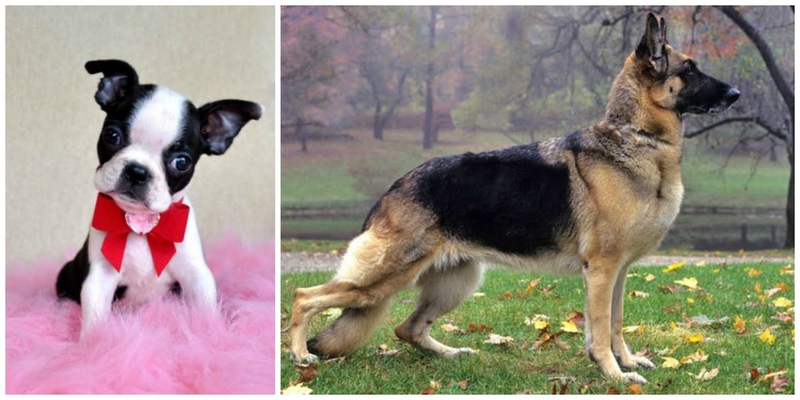 . . a little girl Boston Terrier or a big boy German Shepherd. The hard part isn't deciding on the breed, it's finding a reputable breeder that has available dogs. And please don't judge because we want a pure bred puppy . . . if you know me in real life, I've done my fair share of dog rescuing. And that gorgeous blond girl above was literally found in the middle of the road and saved by us . . . check out her story HERE. It's clear I have an animal problem. I would have a menagerie if it weren't for Getzy keeping me in check . . . which I am grateful for most of the time. This week Amanda and I accidentally bought a bird feeder and a 20 pound bag of food to lure the songbirds to our deck. We spend a lot of time out there relaxing, reading, and chatting so we thought it would be fun to share it with our fine feathered friends. to the birds that it's open for business because nobody has shown up yet. Getzy is sitting at the counter with me while I'm cooking dinner, and he happens to see the store receipt. He asks about the bird feeder, and Amanda and I both look at each other like we don't know what he's talking about. Amanda then blames me, and I blame her. In the end, Getzy just needed clarification that I didn't buy any actual birds . . . the irony is that he knows that's a possibility. Fun fact - Getzy hates birds . . . I on the other hand would commit to own a parrot for 70 years if he would let me. He's obviously the yin to my yang. As I mentioned, July is my birthday month. Honestly, summer birthdays are kind of a drag. You know what I mean if you have one. 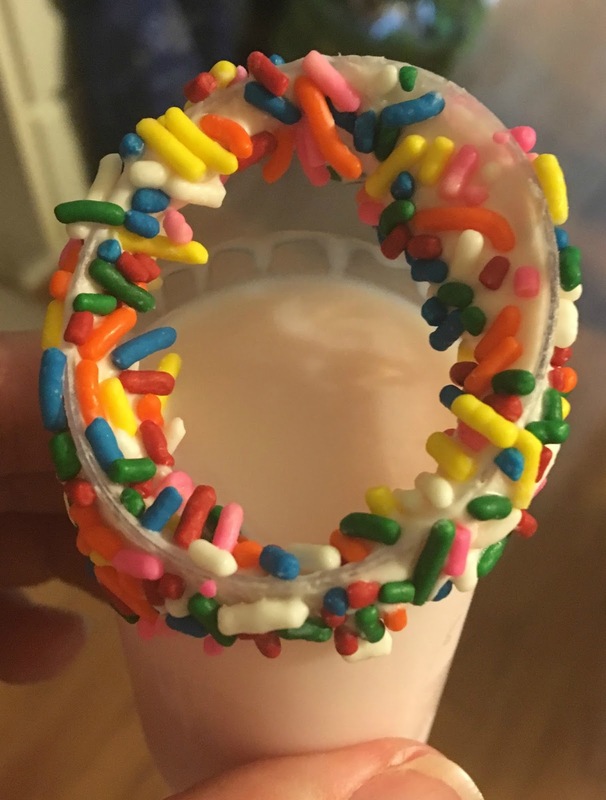 You never got to wear the hat in school, your mom never got to bring cupcakes to share with the class and everyone is on vacation when you try to plan a party. Since some of our favorite people will be out of town on my actual birthday, they surprised me with dinner out at a new restaurant to celebrate with me. 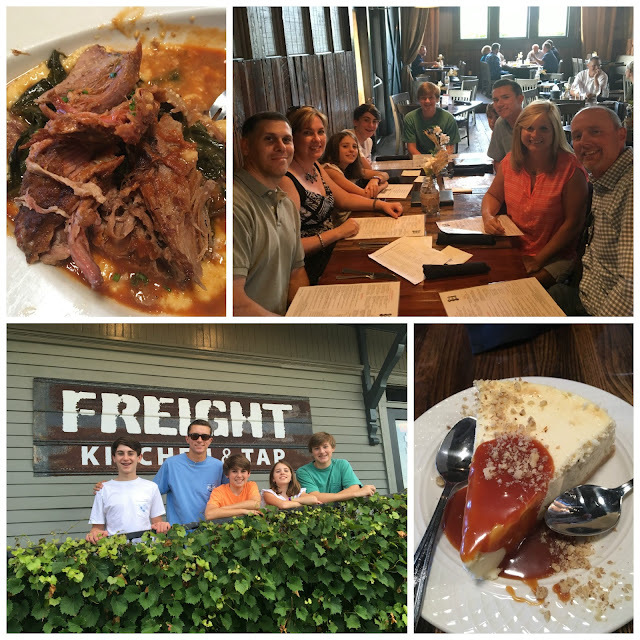 We went to Freight Kitchen & Tap! It used to be an old train depot so the building was so unique! The appetizers were delicious . . . we enjoyed fried mac and cheese balls, brisket poutine, fried green tomatoes and pimento cheese dip. I got the pork braise for dinner . . . tasty but too much sauce watering down my grits. I'm serious about my grits so don't mess with them. They offered a free dessert in honor of my birthday so I chose the lemon cheesecake . . . it was lovely. Spending time with friends makes me so happy . . . life is so much better with good friends by your side. And my sweet friend Michelle, the cute little blonde above, got me the coolest gift . 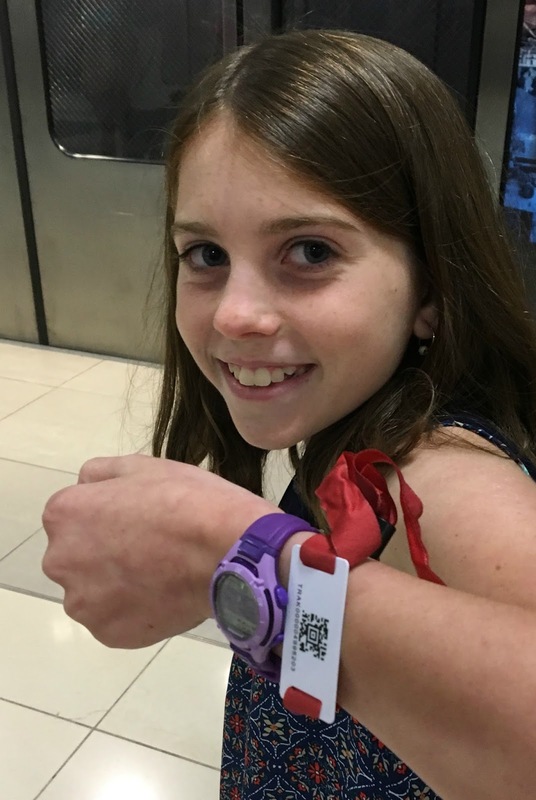 . . a "Ginger Snap" bracelet - have you heard of this? I LOVE the charms she picked out for me . . . so perfect! You purchase a single piece of jewelry and then buy the charms that "snap" on and off to change the look. It is freaking adorable and awesome and such a fun gift! And you're welcome for sharing because now you know what to get your friend or relative for their next birthday!!! Here's to you Michelle . . . I was looking for thoughtful friend quotes . . .
so this is what I settled on, because I'm so thoughtful. 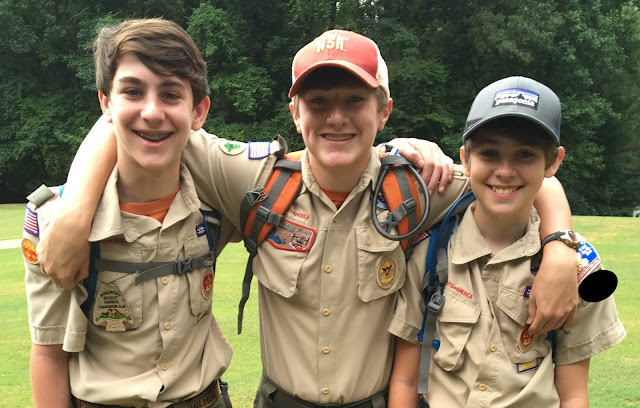 My boys are heading off to scout camp next week . . . they will be gone for six nights sleeping in either hammocks or canvas tents. Obviously we don't make them go, but they love it. It's way harder on me than them. Every year I box them up a care package and send the Friday before so they will have it by Monday. I received instructions this year to focus on candy, snacks and maybe a ball but not to waste my money on other trinkets. Fair enough I guess . . . we don't need any more crap around here since I keep trying to get rid of stuff. 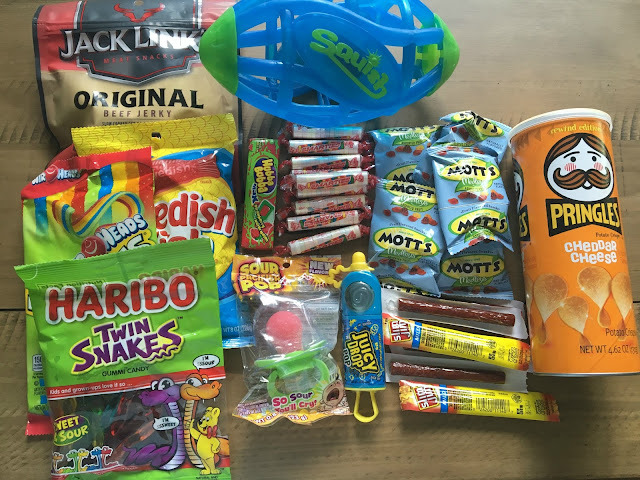 In case you need ideas of what to put in a care package for boys heading off to camp, this is what's included in ours. Obviously no chocolate because summer in Georgia. Each boys gets his own box . . . basically the same stuff with different colors/flavors. And last, but certainly not least, today . . . if you are so inclined, take a moment to watch this video. Her parents have created the Ellie Helton Memorial 5K & Fun Run in her honor to support research about brain aneurysms. If you are in the Raleigh, NC area, the race will be held on October 15th this year. If not, you can "virtually" run and also donate. Everyone has causes near and dear to them . . . just passing this along in case it sparks an interest in you. That's a wrap . . . I like doing these posts because they are just a hodge podge of things and thoughts that don't necessarily get remembered as life travels on . . . I don't want to forget all the little details that make up the big picture of life. Linking up because it's a fun way to share posts and meet new virtual friends. Enjoy your weekend . . . make memories!